• Red Zone Neighborhood Grill, 762 W. Main St., Blanchester, Aug. 29. Critical: The following temperature violations were found: Raw hamburgers 48°F, pulled pork 44°F, swiss cheese 54°F, sliced turkey 50°F, cup of mac and cheese 45°F, raw chicken 49°F in the prep cooler along the wall. Chicken prep cooler behind the grill: Raw fish 58°F, chicken tender 57°F, chicken pieces 48°F, mushrooms in batter 58°F. Raw chicken in breading was 79°F. All TCS foods must be kept cold at 41°F or below to reduce the risk of possible bacterial growth. Facility closed voluntarily. Facility must stay closed until re-inspected by Health District to ensure coolers are staying at proper temperature. There was a package of pork butts defrosting in a container of standing water. Hood unit dripping grease down to towels behind grill. Towels catching grease from hood unit. • Red Zone Neighborhood Grill, 762 W. Main St., Blanchester, Aug. 30. Follow-up. M&M Services serviced cooler units. Chicken cooler appears to be working well. Ranch dressing was at 43°F (must be kept cold at 41°F or less). Cooler may need to be adjusted to ensure food is kept cold. 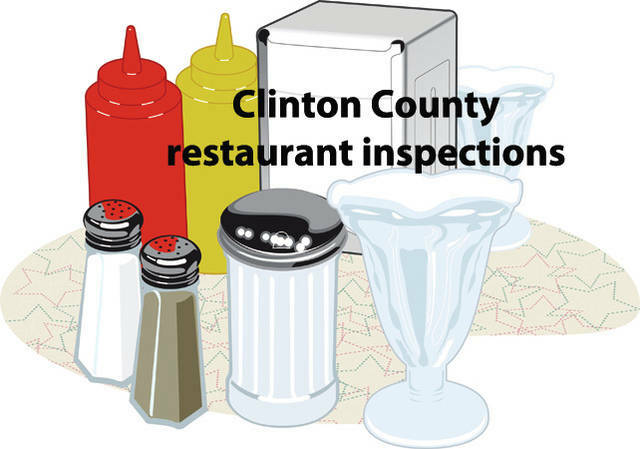 Re-inspections on Aug. 31 to check temperatures on both prep coolers. • Happy Wok, 1655 Rombach Ave., Wilmington, Aug. 28. Critical: In the prep cooler the raw chicken was 46°F, raw beef was 42°F and the bamboo shoots were 45°F. There were towels lying on the counter when I arrived. Large packages of frozen meat were not covered. Outside of plastic containers that held vegetables and food product in reach-in cooler were dirty. Chicken cooling in back room (there were 5 trays); 4 trays were cooling on cooling rack, 1 tray stored on top of prep sink cooling. Cooling food must be protected from any possible debris or spillage. Note: Extremely hot in the facility, which may be making equipment not work properly. • Beaugard’s Southern BBQ, 975 S. South St., Wilmington, Aug. 24. Counter under cutting board not smooth. Freezer lid damaged. • Burger King, 1607 Rombach Ave., Wilmington, Aug. 24. Complaint. Claims bread tie found in sourdough double sausage sandwich. Investigated complaint. Spoke to general manager about complaint. He was aware of complaint. Sourdough bread is only bread with bread tie. New sourdough bread is stored on shelf, bread tie removed prior to placing on sandwich line to prevent physical contamination from bread tie. Management corrected concern. Please watch for physical factors that would cause contamination to food. Thanks for cooperation. • Gold Star Chili, 1295 Rombach Ave., Wilmington, Aug. 22. Dating and labeling is great! Keep up the good work! Table near mop sink with utensil storage. • Fiesta Veracruz, 37 W. Locust St., Wilmington, Aug. 22. Critical: Tomatoes 42°F, raw beef 42°F, queso 42°F, chicken 42°F (Must be maintained at 41°For less). Seal on Pepsi salsa cooler damaged. Light bulbs nonworking above prep cooler. Cooler and wall chipped/damaged at food service area. Dry stock room is cluttered; must be organized and items stored above ground 6 inches to monitor/control pests and help with cleaning.